You’re probably already thinking, “bacon? who puts bacon in granola?” Well, as it turns out, that’s a thing. I found quite a few bacon granola recipes and I combined them with apple pecan granola recipes to develop this delicious and easy granola recipe that I’m dedicating to my new home state, Arkansas. This blog is also being featured on the next Foodie Friday entry for Arkansas Women Bloggers. So, why call this Arkansas Granola? I used Petit Jean Meats bacon, which is based here in Arkansas. The company is a sponsor of Arkansas Women Bloggers, so it seemed even more fitting to include them. Arkansas, specifically Benton County, used to be one of the top apple producers in the country so that too seemed the perfect fit. Finally, pecans are the Arkansas state nut. 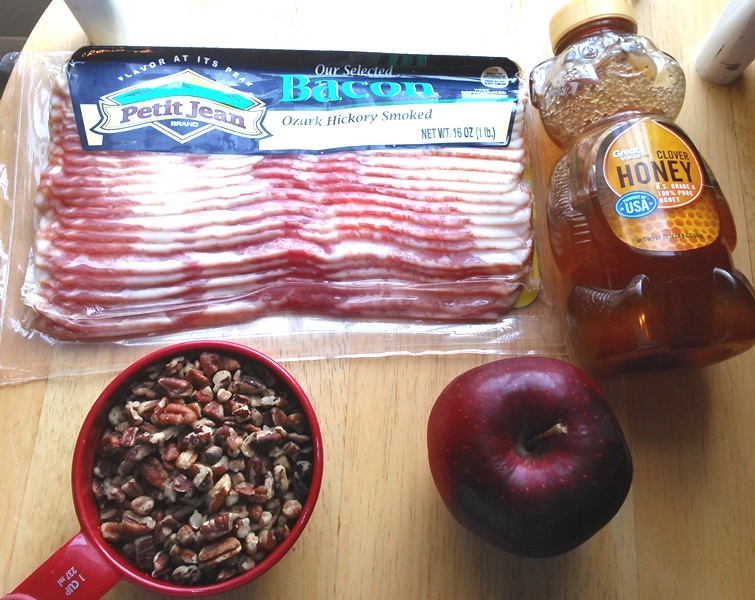 So there you have it: bacon, pecan and apple granola! Oh, and of course I used honey as my binding agent! I usually use your basic clover honey from the grocery store but Arkansas is also home to many great local honey providers. I personally think this would be strange with milk as a cereal but many who made bacon granola said it’s great on top of yogurt. It’s great as a snack and uses the natural sweetener honey so I would consider it a decent after-school snack for kids. It does have fresh apples and bacon in it so I recommend storing it in the refrigerator with a tight lid. Arkansas granola not your thing? Remember, I’ve done two other granola recipes (both sponsored) in recent years. My PBJ-inspired granola uses peanut powder and my nutty holiday granola uses Planters holiday nut blend. That’s enough talking! 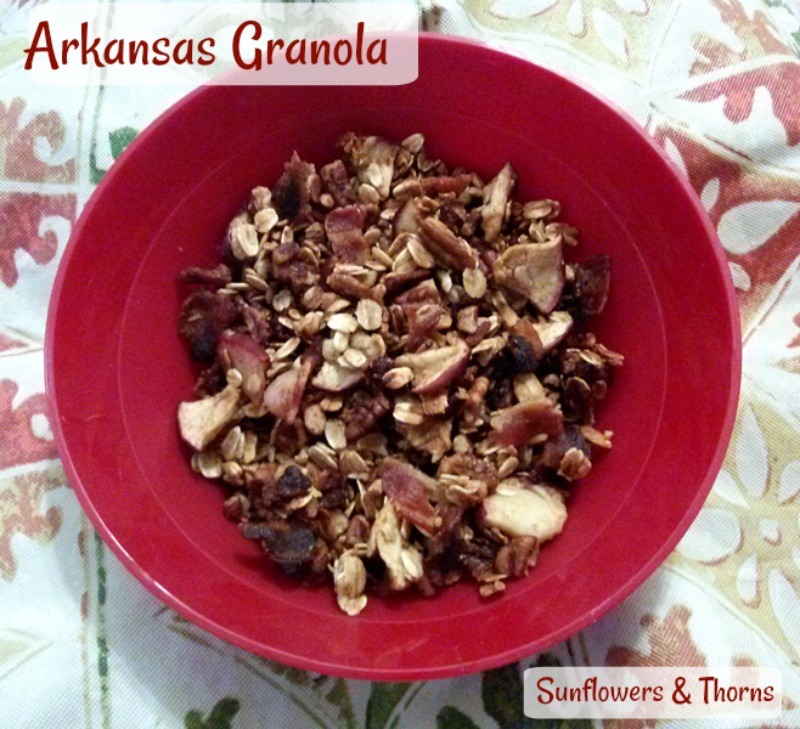 Let’s make this amazing Arkansas Granola to celebrate the Natural State. Fry the 8 slices of bacon until they are just cooked and not yet crispy. Place the finished bacon on a paper towel to absorb some of the grease. While the oven is preheating, dice the apples and, if necessary, the pecans. Combine the apples, pecans, oats, bacon, cinnamon and nutmeg. Mix in the honey with the dry goods. Spread the mixture on an aluminum foil-covered baking sheet (spray the aluminum foil with baking spray). 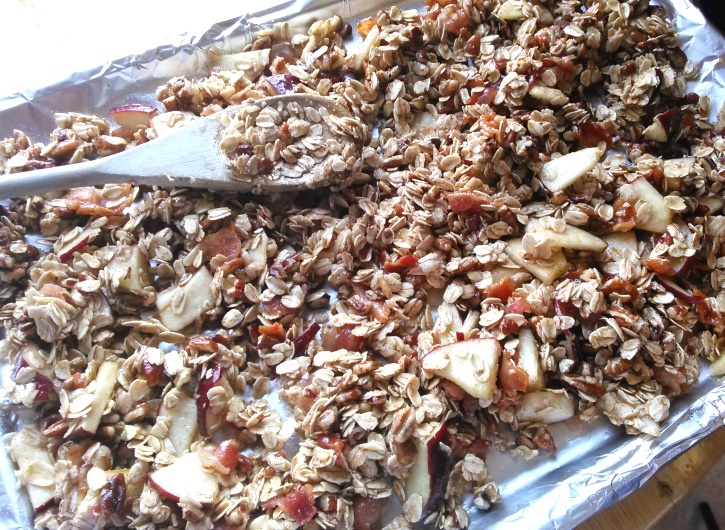 Bake for 25-30 minutes, gently turning the granola every 10-12 minutes. Remove the pan from the oven and let the granola cool. It will crisp up as it cools. Serve immediately and store the leftovers in an airtight container, preferably in the refrigerator. 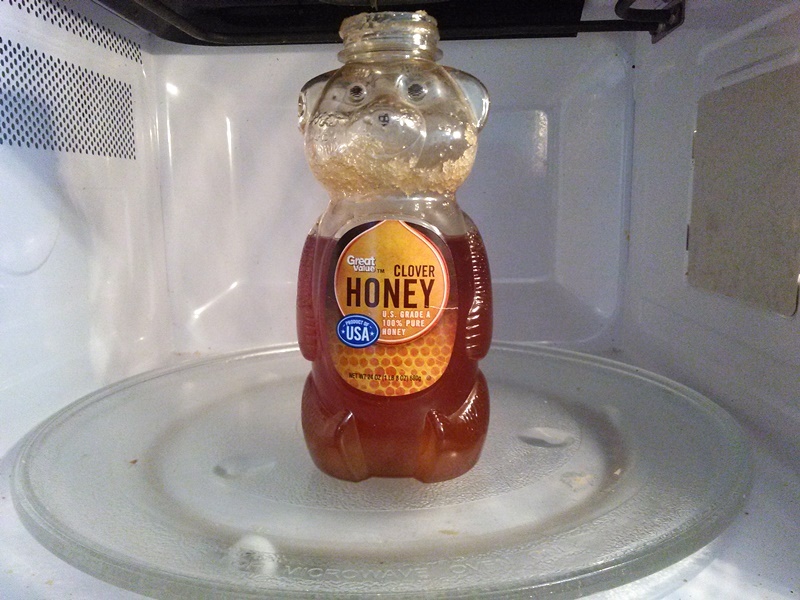 If you’re anything like me, your honey might be a bit crystallized. Remove the lid (that part is important) and heat it gradually in the microwave. I heated it for 15-20 seconds at a time and stirred it between each microwave session. I probably should have heated it more than 30 seconds because it was still a little thick when I poured it into the granola. Choose a baking sheet that is bigger than you need. I chose one that was just the right size for the amount of granola I had but that made it hard to neatly stir it during the baking process. Several clumps went over the side!